A special panel of Pope and Young Club judges recently announced a new archery world record Alaska brown bear. On Monday, Sept. 24, 2018, the Pope and Young Club conducted a special panel of judges in Windsor, Colorado, for a potential P&Y world record Alaska brown bear. 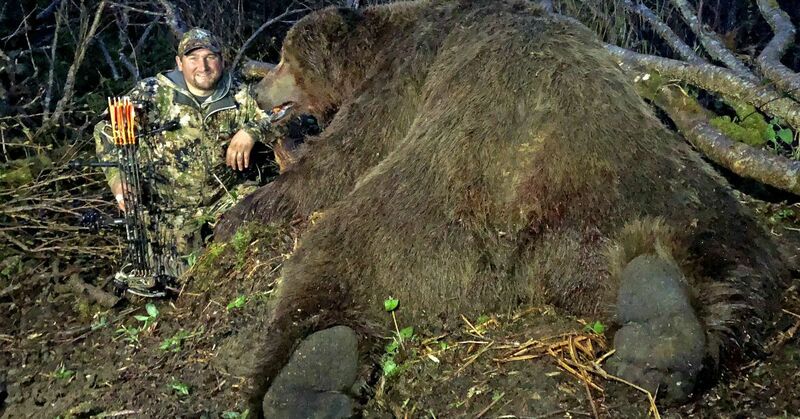 Chris Cammack's enormous bear was shot on the Alaskan Peninsula in May 2018. Measurers present at the Special Panel were Barry Smith, Lee Kline and Ed Fanchin. The original score of 29 4/16-inches was confirmed, surpassing Jack Brittingham’s 2004 bear by 1/16 of an inch. "Chris is a very excited and humble man," stated Ed Fanchin, Records Chair for the Pope and Young Club. "Chris's bear skull will be at the Pope and Young Convention and I recommend that everyone come see this fantastic bear in Omaha, Nebraska, April 10 - 13, 2019. It was a pleasure to be a part of the recent Pope and Young Club special panel of judges who measured Chris Cammack's giant Alaska brown bear. The Club’s process of recognizing potential Pope and Young world records has been working out very well. Congratulations to Chris and the Alaska Department of Game and Fish for doing outstanding conservation work." "It is still so surreal to me, the thought that I would have ever had the opportunity to hunt an Alaska brown bear with my bow, let alone honored enough to harvest the new P&Y world record," said Cammack. "Thank you to everyone that helped make this dream a reality. Special thanks to my friend and guide, Cole Kramer, and especially my wife, Felicia, for supporting me and allowing me to chase my dreams. Usually, Felicia is right beside me with her bow in hand, but this trip she stayed home and took care of our baby girl, Davoni. Coming home to them is a true blessing. Getting to spend two weeks with my friends in the bush of Alaska was the greatest adventure of my life, harvesting a new world record brown bear was a bonus." This incredible world record Alaska brown bear has been entered into the 31st Recording Period — the biennium representing entries accepted into the P&Y Records Program from Jan. 1, 2017, to Dec. 31, 2018. At the close of every biennial recording period, numerical awards and honorable mentions are awarded to the most outstanding bow-harvested animals in each species category that have been entered during this two-year recording period. New world's records are verified and proclaimed, and awards are presented to these outstanding animals during the Pope and Young Club's biennial convention and awards banquet. The Pope and Young Club is a non-profit North American bowhunting and wildlife conservation organization dedicated to the promotion and protection of our bowhunting heritage and values, and to the welfare of wildlife and habitat. The Club also maintains the universally recognized repository for the records and statistics on North American big game animals harvested with a bow and arrow.